About mid way between Housesteads Roman Fort and Chesters Roman Fort is a fairly large car park on the south side of the B6318, the road that follows the line of Hadrian's Wall. This is Brocolitia, also known as Carrawburgh, and although it is not immediately obvious from the car park, it's a stop that is well worth making, as it allows access to a monument that is unique on Hadrian's Wall, the Brocolitia Mithraeum, or Temple of Mithras. The path to the temple from the car park skirts two sides of a grassy rectangle surrounded by raised mounds. Today this is all that can be seen of Brocolitia or Carrawburgh Roman Fort. The fort was built in about 130, some time after the nearby wall, and the vallum had to be filled in to provide a flat surface on which the fort could be built. 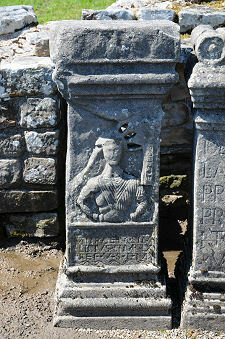 When complete, Carrawburgh Roman Fort covered an area of 3.5 acres or 1.5 hectares. In the third and fourth centuries it served as the base for an auxiliary unit, the First Cohort of Batavians, a Germanic tribe whose home was in the Rhine delta, in what is now the Netherlands. The site of the fort is privately owned, but it is possible to wander across its grassy mounds and wonder if the sheep appreciate the history associated with the ground on which they are feeding. Or whether we do, for that matter. Small parts of Carrawburgh were excavated in the 1870s, but most of it has been left untouched by excavation, and it is fascinating to think what might lie beneath the surface, waiting for a future generation of archaeologists to find and interpret. 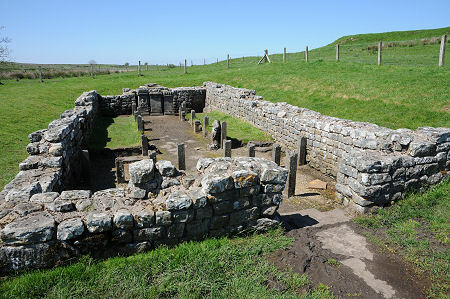 The Temple of Mithras can be found in the valley of a stream immediately below and to the south west of Carrawburgh Fort. Mithras was a Persian warrior god who, according to legend, entered a cave and killed a bull that had been created at the dawn of time. The cult of Mithras placed great emphasis on valour, honour, and military prowess, and Temples of Mithras, or mithraea, were fairly common in civilian settlements close to Roman forts. 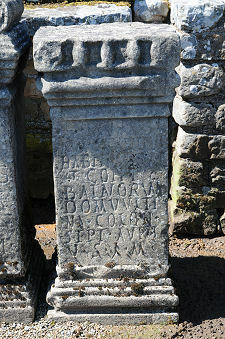 Several are known to have existed along Hadrian's Wall, but Carrawburgh's is the only one that can be seen today. Temples of Mithras tended to be sunk into the surrounding landscape and be entirely without windows, in an attempt to recreate the sense of the cave in which the bull was slain. What you find at Carrawburgh is the stone base of a rectangular building, with walls rising, at their highest, up to about eight courses. It will not escape the attention of most visitors that the ground around the temple, especially at the entrance end, is very wet. When the temple was excavated in 1949 the ground conditions meant that the bottoms of the wooden posts supporting the interior partitions within the building were well preserved. These were reproduced in concrete and replaced on the site, so that today it is possible to get a feel for what was originally found, and a sense of how the inside of the building might have looked. 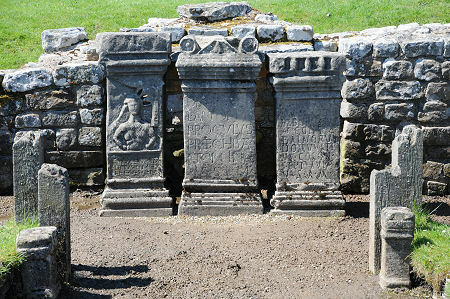 The excavations also uncovered a series of altars which had been placed at the north west end of the building. 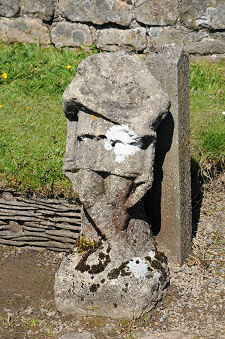 These have also been reproduced in concrete and the copies can be seen and enjoyed in situ by visitors. It is almost invisible today, but excavation of the temple also uncovered a "nymphaeum", a semi-circular stone seat partly surrounding a well, with an associated altar, close to the entrance of the temple. This was dedicated to nymphs and to the spirit of the place in which the shrine stood. Meanwhile, not far from the temple towards what is now the main road is an area of boggy ground which was once the site of a notable discovery. This was the location of "Coventina's Well", which was first found by an antiquarian in 1732, then rediscovered in 1876, when an excavation took place. What emerged was a superb collection of offerings left to the goddess Coventina over a prolonged period of time. These included 22 small altars and a huge quantity of coins. 13,487 were recorded, but several thousand more were probably taken by the people who flocked to the site when news of the discovery emerged. Nothing remains of the shrine (or its contents) today. It has been suggested that the presence in such close proximity of three temples or shrines to different gods might indicate that there was some sort of religious centre in the civil settlement on this side of Carrawburgh Fort.